The Gitzo Padded Tripod Bag GE12P has been replaced by the Gitzo GC-2100 Padded Tripod Bag. The primary difference I see on paper is a "Double-Ended Zipper". Having purchased one, I can tell you that the GC-2100 is not as large in diameter as the Gitzo Padded Tripod Bag GE12P. There was no way my Gitzo 3-Series tripods will fit in this case. My Gitzo G1327 Tripod with an Arca-Swiss B1 Ball Head attached fits perfectly in the Gitzo Padded Tripod Bag GE12P. It is not too small, not too large, but exactly what I was looking for. The Gitzo GT3530LSV tripod is really tight in this case - It begs for another inch of diameter. 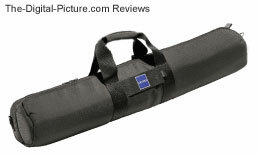 The Gitzo Padded Tripod Bag GE12P measures 33 1/2" long by 3 7/8". It is not hard to get a significant amount of money invested in quality tripods and ball heads. You will want to protect your investment with an equally high quality tripod case. Gitzo padded tripod bags are made from a tough nylon material that Gitzo refers to as rainproof. Padding adds to the protection. Access to the bag is provided by a double-zipper. A small zippered pouch inside the bag can hold a remote release and other accessories. A double handle provides strong support and a shoulder strap makes transporting a tripod easier. A Velcro-covered luggage tag allows identification. I recommend using Gitzo's dimensions to find the proper size case (models GE10P through GE15P) - not their recommended tripod fit.